ARINC 825 Verification IP implements the digital transmision system have been specified for inter-unit and inter-systems communications on board transport aircraft. 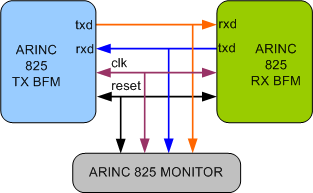 ARINC 825 Verification IP provides an smart way to verify the ARINC 825 standard data transmission and control interfaces between transmitter and receiver.The SmartDV's ARINC 825 Verification IP is fully compliant with ARINC specification 825 - 2 and provides the following features. Supports ARINC specification 825 - 2. The model has a rich set of configuration parameters to control ARINC 825 functionality. Supports one-to-many communication and also peer-to-peer communication. Supports all the four frame types. Supports all the five types of error insertion and detection. Supports all the node service interface as per ARINC 825 -2 specification. Supports Bit by bit Arbitrations. Callbacks in transmitter,receiver and monitor for various events. Faster testbench development and more complete verification of ARINC 825 designs. SmartDV's ARINC 825 Verification env contains following. Complete regression suite containing all the ARINC 825 testcases.